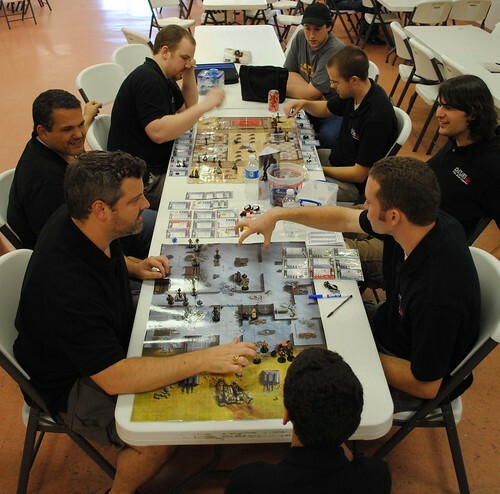 SWMGAMERS.com Forums • View topic - Atlanta 2010 SWM Regional! 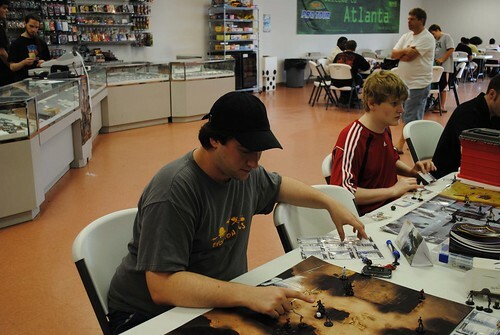 Post subject: Atlanta 2010 SWM Regional! Additional prizes will be provided! Format: 200 point DCI, restricted map list. There will be a number of swiss rounds based on attendance, which will cut to a top 4 for a playoff. 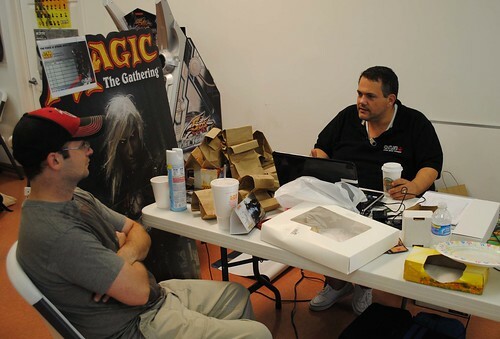 Post subject: Re: Atlanta 2010 SWM Regional! Lou, it would be AWESOME to have you guys down here again. Also a heads-up that if anyone needs a place to stay in Atlanta the night before or after several of us can put you up. I think we've already got 6-10 people doing that but there's definitely space for more. First of all I want to thank all 23 players who attended today. A list of the pre-playoff standings will follow soon. I would especially like to thank everyone who came in from out of town for the event. David and Greg make it through to the final match and David came out victorious. Congratulations to David Weeks and everyone who played today. A more in-depth report is being compiled by Graham and I would like to thank him and everyone else who contributed to making this a successful event. ahhh another padawan reaches a new level!!!!! Great job David I knew you could do it!!!! David played a Republic squad featuring Yoda on Kybuck, Captain Rex, Plo Koon, Panaka, Doom Bot, Lobot, Mas Ameda, a Rodian Brute, and some uggies. Last edited by ndjarnag on Sun May 23, 2010 12:23 am, edited 1 time in total. There is a minor report including a slide show of pictures that I took throughout the day on the AtlantaSWG website (click the pictures on the slideshow to embiggen). Just want to first say, thanks for putting me and Jason up for the night so we could play in your guys' regional! We both had a great time, and I'm proud of our 6th place/7th place showing (yes I outranked Jason in this tournament, thank you very much Bill ) at the event. All last week, I tinkered with the idea of a crazy squad design that I am keeping close to the chest for the time being because I may still pull it out at another upcoming tournament and don't want too many people to see it before it hits the table. However, as we were driving down there (about 5-6 hour trip one way) we were detoured around I-24, which added an hour to the drive. It was somewhere during this slow, rigourous trek across 2-lane highway traffic that I decided going so far, I shouldn't goof around. 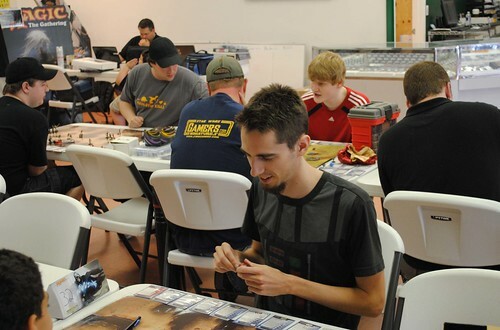 Last week, at the Owensboro regional, I ran a Camaasi instead of the Ug/Mouse combo. This time I put it back to Deri's build, just to see if there was any difference. Well all I can say is that in a field of 30 players last week, I finished 10th and this week in a field of 23 players, I finished 6th. You be the judge. Game 1 vs. Jarred, who had Vader LotF, Thrawn, Cad Bane, Moff Nyna, Storm Commando, Mas. We played on Ravaged Base and I set up outside (which is where this squad wants to start, honestly). It was pretty straight forward. I outactivated even without reinforcements, and so I brought in a couple of R7's and 3 Mice (this was a standard default reinforcement for me through most of the games I have played with this squad). I levitated Mara up to hit Cad, lost Mara, and then let Anakin UtF a couple of times. After that it was Vader against my entire NR build (sans Mara, of course). The guy who played the squad was very cool the whole game and I was pleased to see him walk away with the sportsmanship award. On Bespin, this guy didn't have Ozzel, and so I simply outactivated him. I could tell he was probably a newer/less experienced player, and for the first time in a long time, I had to refrain from giving my opponent strategic advice because it was an advantage for me either way. He had Mara at 20 and missed an attack with Scourge Vader, but didn't reroll with a Force point. Telling him this, even to be helpful, would have just put Anakin into play, and so I didn't say anything. It was a tough call. This was against Graham. I'm not going to lie, the guy just outplayed me, and I relied too much on Dodonna. If I had not, I would have won. I had 2 chances to finish off Rex and I blew both of them because I didn't want to activate 2 characters. It was an important reminder that being able to choose 1 doesn't mean I should always do so. This game was against David Weeks on Muunilist. Now, before I go any further, I want to explain my thought process (I know Dean is reading this one!) Anyway, I brought a bunch of different reinforcements with me for this tournament. I wanted to test some different ideas, different strategies. Weeks brought Yobuck and Plo Koon (the new one) with Rex. Most of my games were being decided in the first six rounds, so I figured this was a good time to test the MTB. All I had to do was win initiative in the first 4 rounds, kill Yobuck, kill Rex, and then either the game would be won, or Mara would die and I would UtF to kill the MTB. I figured, what the heck? Total mistake, coupled by another mistake. He towed up Yobuck, and I could have levitated Mara but I miscounted the squares and so I activated Han instead. Then I realized what I had done wrong. She could have based Yobuck AND assaulted! Doh!! Well at this point I knew I was out of contention for top 4, so I just went back to auto-pilot. I figured I'd either face someone having a tough day, or a good opponent who just had a rough pair of breaks. Turns out I got paired against someone who seemed to be right in the middle of that combination. THe kid had Twilek Black Sun Vigos with Grand Admiral Thrawn, Imperial Gov. Tarkin, Ozzel, Xizor, and a pair of Czerkas. I used Han to kill one of the Czerkas, then sent Mara running after the TBSVs. He conceded when I killed the last one. Good enough to get 2 boosters, so I was happy. Jason finished 7th with Mandos. I'll let him tell you about that. Both of us only lost games to the top 4 winners, so I felt pretty good about that. PC problems, sorry. Meant to mention real quick that Chuck and his judge's team did an outstanding job with the tournament. Very impressed with the store, too, and hope to come back sometime! I had a great time in Atlanta. Thanks to Echo for putting us up for the night. Chuck ran a great event and everyone I met was great. As Dennis said earlier I finished in 7th with a 3-2 record playing Mandos. Yes Mandos. Right of the bat I had to play a rebel squad with evade. Something I really was not looking forward to doing. 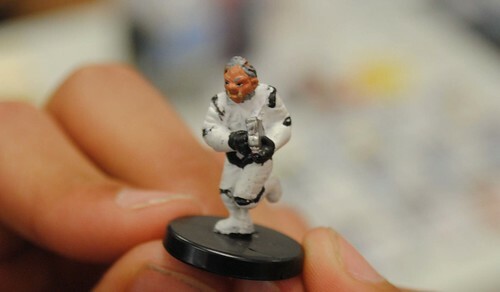 He was playing Reeikan, Dodanna, the new Lando and Red Hand Troopers, Ferus Olin and Dass Jennir. Round was mostly positioning. He did not have door control and after taking out Ferus, Dass and the troopers he conceded. Round 2 I run up against the only Snowspeeder build in the tournament. We play on Ravaged Base. I start on the outside and he sets up in the middle room. I run an ug to the main door to open it on the first activation. He spins a fig and I then use my R7 to open the middle door giving Boba los to an unactivated Snowspeeder, three missed evades later and the speeder has taken 60. He then used Deliah Blue to repair 30 damage. I move in to the interior of the base and he moves Han and Leia forward for shots. Next round I damage the speeder again and he makes the last evade keeping it alive and reparing back to sixty and moving the speeder out of the main room. Im able to base an uncatived Han with a Gunslinger killing him. My other Gunslinger bases the speeder and puts 50 on it putting it at 10. Speeder dies next and its mop up from there. 2-0. Greg is playing Mara, Kyle JBM, Ganner, Dash, Jag, etc... I used the R7 to give Boba an early shot on Kyle putting 30 on him. He keeps his figs out of los from that point on and out activates me. I mostly position for better shots across the map staying out of range of a levitated Mara. I manage to kill Jag and start moving forward to try to kill some more points. I move Boba six squares to get los on Mara putting here to 50. Boba takes 100 in return from Dash and Kyle. The next init is crucial. Greg rolls a four and then I roll a two. D’oh. He uses Mara to kill Boba and my Gunlsingers take out Kyle. The TBSV puts 30 on Ganner. Greg is ahead on gambit and proceeds to retreat as my forces advance. By this point I had lost all my door control and he locks me out for the win as time runs out. 2-1. I play a Mando squad with no Boba but a ton of Scouts and Gunslingers. Im out activated again but have the door control advantage. It’s a very back and forth match and I cant many shots. I manage to kill a scout and two caamasi to get the lead but a Gunslinger crits twice on Boba killing him. Im in real trouble at this point but manage to kill another Gunslinger. I pull ahead on points just as time runs out. Well we are playing for a spot in the top four at this point. 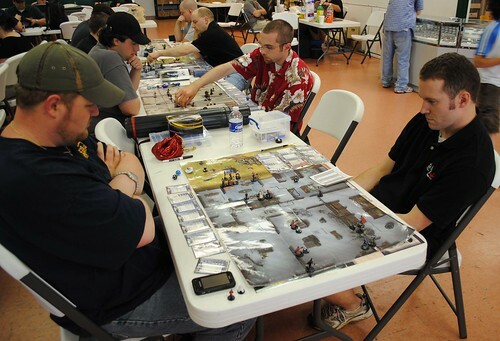 Im proud just to be in this position playing Mandos. David is running Plo Koon JM, Yobuck, Rex, and Panaka. We play on Munnillist. Round 1 I am able to open a door with R7 and my Gunslinger proceeds to target Panaka I roll three hits. Needing one more to kill him and roll a one. If I had hit it may have been over right there. David wisely repositions and Yobuck proceeds to start pummeling my squad. I put Yobuck to 100 losing my Captain and Scout in the process. I manage to kill all the swap fodder and R2 and put Plo to 30. I set up a shot at his 50 hp Yobuck with Boba if I win init. Again I lose the crucial init and he moves Yobuck killing my R7 and TBSV. I then kill Lobot instead. Rex crits on my last Gunslinger and I miss the evade killing her. He does for to Boba to Yobuck putting him to 20. I then kill both Panka and Plo with Boba on the same activation. Leaving a 50 hp Yobuck , Rex and Mas vs Boba and a Quartermaster. The next init is going to decide the game. David gets and gallops Boba killing him and taking 40 from the Quartermaster. The Quartermaster kills Yobuck but is no match for Rex and that’s game as time runs out. Congrats to David on the regional win. He played great and really deserved it. I had a great time and accomplished my goal of going 3-2 with the Mando squad. 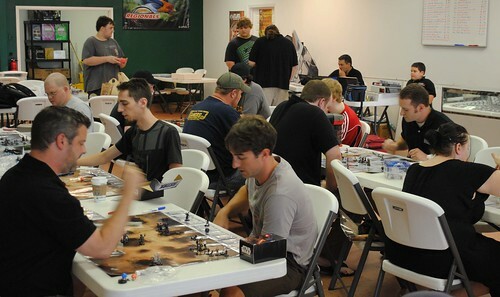 I only lost to the guys who got to the finals and played them both to time so I was happy with my results. Thanks again to everyone in Atlanta for doing a great job. I really enjoyed the Atlanta regional and greatly appreciate Daniel for putting Andy and myself up for two nights. Now you can ask Weeks, but I went back and forth for about 2 weeks deciding if I actually wanted to play, or simply watch. Then on top of that I had to decide what squad I would play if I played. Anyways I decided Friday night after talking with Jason and Dennis that I would play. I decided to go completely out of my element and play a faction that I had not played much. I chose Seperatists and in finished in 5th place just out of the playoff (which I actually did not want to participate in) and in a "tribute" to engineer this was my squad. I built this squad with New Republic in mind knowing that at the Pennsylvania Regional I had seen a lot of New Republic builds. This build is not commander effect dependant and that is a good thing. Lo and Behold I get New Republic first round so I was glad to get the chance to play it for all it's glory. For my reinforcements I brought in San Hill and 3 Battle Droids out of necessity against Dodonna. We break for lunch and we come back 3rd round, and I am expecting to get paired against one of the Charlotte guys because we are all like 1-1. I am pleasantly suprised to see that I am paired against a guy from Atlanta named Josh. He is running a FlObi/Rex 501/Cody squad. I chose not to bring in San this time and instead I brought in 2 Super Battle Droids with Nute. 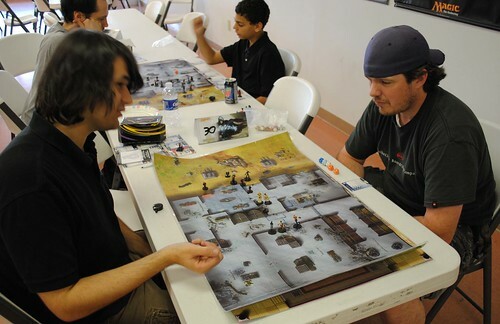 I win map roll and we play on my map which is Jedi Temple. He chooses to set up first and sets up on the outside of the map. I set up very symmetrically in the back middle of the inside and then we go to init. I win and he goes first moving Rex straight up to the door leading from the outside to the central gambit area. I move most of my grunts and then once he is outactivated I use R7 to open the other door. My IG-86 gets a twin Oppo off on Rex dropping him to 20. Then my 2nd IG does the same thing and kills him. The third moves to where he cannot see FlObi and then twins Cody dropping him also. I move the EG-05's up as far as they will go so they can start hitting FlObi. I win init and I choose to go first asking him if he would like to suprise move. He says no and I run my EG-05 6 and twin FlObi but miss an attack, taking him to 90. He uses all of his pieces to drop my EG-05 including FlObi, leaving me with 6 shots from the 86's on FlObi. I manage to get 2 of those through dropping FlObi to 30. I then move my other EG-05 to where he can get either his ARC Sniper, or FlObi. I win init and let him go first. He suprise moves away but still within 6 of my EG-05. So with the fork I created I go after FlObi and twin to finish him off. From there it was mop up. 2-1 3pt win. Round 4 vs Ben on Rancor Pit. Round 5 vs. Stephen on Jedi Temple. I scored a total of 9pts and was out of the final four, which really didn't bother me since I had already achieved my goal of "winning" my pass in Pennsylvania. I got to go 4-1 and did not have to play 1-2 more rounds. 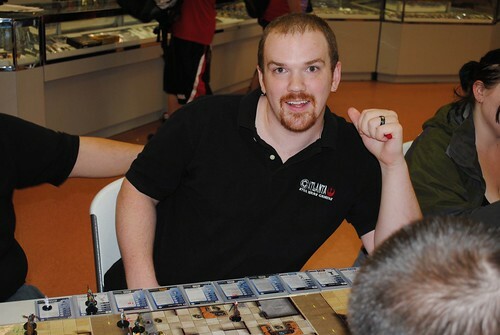 I was able to sit back and watch my good friend David Weeks win his GenCon pass which made me happy. Congratulations Again DaviD!! Well done. Every single person walked away with prizes yesterday, most with multiple rare or very rare figures. 2nd, 3rd, & 4th place each got 4 boosters of MotF. 6th, 7th, & 8th place each got 2 boosters of MotF. 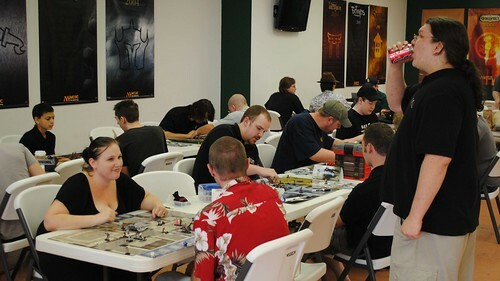 Players 9th through 20th each got a single booster of MotF, and 9th through 23rd place each got a grab bag containing a minimum of one random rare/very rare miniature, in most cases 2 rare/very rare miniatures. The sportsmanship award consisted of the 30th anniversary collectors edition Star Wars pop-up book, the Lego Star Wars Visual Guide, and the Star Wars Head-to-Head book. Thanks to everyone for the kind words. Heres a very quick breakdown of my matches and thought process during the event. First round i have to play my best friend who was packing Kyle, Mara, Dash, Ganner, Beard. He avoids my Plo Bait and rolls like 7 crits and just straight outplays me. I lose which i was ok with if your going to lose drop the first one and win out of the losers bracket. Vong just couldnt react to yoda pounding on them and swapping away, that and rex attached at the hip to Doombot was just too much firepower for him. John's a great sport and doesnt mind representing the Vong Faction at any event. It does take me like 8 rounds to kill off those pesky Vong due to crab armour but i win pretty easy. This one was interesting he ran the Bloomilk squad "Revans Antarian Fury" A squad ive always wanted to play against. Basicly the kid is still learning how to play so Plo just straight up Pwns Revan and yoda kills the rangers in 2 rounds. He did manage to Force push my Yoda into a pit and i failed the save, so he was happy he got to do something cool. 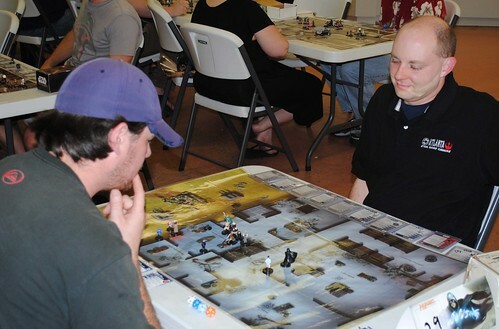 I look across the table at dennis puzzled as he lines up his Muun Tactics Broker fodder then proceed to count squares across the table and realize i can kill just about all his scrubs with 3 acts and swap yoda back, so i do so. From there it was just killing his exit strategy and Han with Plo/Rex and eating some deaths as the muun kills things for me. Dennis as always is a good sport about everything and laughs it off. Jason should have won this game. I got all the rolls in it and setup like a total chump his gunslinger fires 4 shots on panaka to start the game and rolls a 1 on the kill. After thanking him for the 1 i take a round off to repossition and let yoda take some aoo's to just steamroll me some mandos. Got tight at the end but i got the 2 big inits and ended up winning . Graham also should have beaten me i leave panaka on mas to Bg him miscount squares and he gets his yoda all the way across the map swaps with rex and put panaka and mas down to 10 each with BG. Here was the key he forgets to move rex. I win init move my rex to kill his and make my shots. From here he still had a chance so i towed up my yobuck and killed his swappers and doombot and swap for my fodder. His yobuck kept trying but was pinned in place with 60 Hp by my yoda and Plo so if he moved he would die. I got my dudes up to his panaka and ferus and rex wakes up from the nap he was taking all tourney to be a huge stud wins the game. I really wish this game would have gone differant graham made 1 error and had me beat. We will rematch on vassal im sure. So first and last game vs Greg i have all the confidenece in the world with me thanks to my good fortune and 5 game winning streak i have going. I am patieint for the first 2 rounds and dont get gambit and let him get it. I move my fodder to places for rex to snipe which attracts his kyles attention and he moves kyle. Same round i tow my yoda out and move 16 to base Dash and jagged put 20 on jag hit dash with the gallop and crit on the normall attack to take him to 10. Dash and mara both put 100 on yoda. I open the top door from the left side with a brute and rex moves up kills an uggie and snipes dash who fails the evade save. I get rex to safety with swap and attach Plo to Doombot for the next round i also screen against kyle with my fodder so i dont get grenaes thrown at my r2. I win init put 20 more on jag and move torwards gregs backfield and kill his last door control in his r7. THis did 2 things made him choose to levitate to kill yoa (50 hp left) or leave him and let me swap rex into the back field. He Levitates mara out to yoda and she has to move 1 square to assault and she kills yoda. Plo is towed next to Ganner and puts 60 on him. Kyle kills doombot. Ganner is at 40 and would have to move 1 square to get mara back into the fight if he moved Plo would kill him so. Rex comes in the same round and kills ganner and puts 40 on kyle, Panaka also hits for 20 on kyle. I win init and put 60 more on kyle with rex leaving him at 20. Kyle triplles plo i block one. Plo kills kyle. Mara comes in and gets plo dwon to 50. From here i get 60 on mara with rex swap plo onto her and kill her. Greg is a warrior so he plays jagged and dodonna vs my whole squad rex kills the last 2 and im the champ. Really fun day im gald i got to play greg for the win after my horrible loss earlier. Plo Koon is awesome. 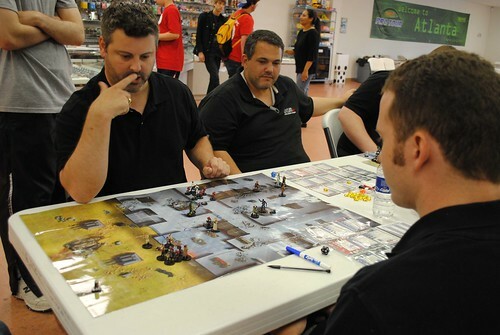 Thanks again to chuck for running another awesome tourney see you guys at gencon. 10. David Gladney AKA Secret Weapon Jr.
Finals was David Weeks over Graham Bingham and Greg Sutton over Phillip Gladney, then Weeks over Sutton. We had every single faction represented, which I believe is a first, and top 10 included Mandos and SITH. Congrats, sounds like a great tourney! Anyone know if Greg Sutton posts on SWM? If so what is his screen name? Now that I've had some time to recover and get some much needed sleep, here's my report from Atlanta. First off let me say a big thank you to Daniel, who let Spry and myself (along with Dennis and Jason) stay at his apartment. Ok, now for the report. I'll be honest...I didn't sleep well at all and it really affected how I played. I thought after breakfast I'd be alright, but I quickly found that wasn't the case. I was a little worried with all of her Mandos that I would fail some key evade saves. I won map and we setup and started. After she activated everything I put the speeder in gambit. We kinda joked and talked a lot during our match, so it was being played slower than it should've gone. And I was trying to make her open a door or two to get into gambit where I had everyone waiting. Needless to say that didn't happen and when time was called I won by a measly 7 points. Final score was 18-11. Another Mando squad, only this time Boba was included. He won map and decided to take the inside of the base. And where I put the speeder was a HUGE mistake. Round 1 Boba could easily put 60 dmg on the speeder and I had to burn Blue's turn to repair it. And that was pretty much the match. He'd hit it (I'd fail evades), I'd heal it. So on and so forth. I started to play more risky than I had wanted here and put Han and Leia in danger. Once the speeder was gone it was pretty easy for him to get to the other attackers and take them out. I definitely learned a lesson from this match. But I'll cover that later. I have to say this before I do this match report. I really REALLY don't like playing Nick. He's a 'Big fish in a little pond' and also 'The Rules Lawyer". (thanks to billiv15 and his article helping me to describe him) Worst part is he doesn't know the rules for SWM all that well and tries to put D&D rules where they DON'T belong. He really makes it difficult for me to like this game. Ok, I'm done with my rant. Super Stealth + Snowspeeder = hard hard match. I won map and he put me on my preferred side. I knew this would be difficult and that I had to get to his commanders with the Speeder and possibly sacrifice it. I do so but he had most of them protected in the turbolifts. I do my best to get to Thrawn and at least get rid of the swap, but with him telling me to hurry up on my decisions and threatening to call me for slow play (which...if you've played me I don't ever do) I make more and more critical mistakes. He wins, don't quite remember what I lost. I think the Speeder died along with some Uggs or something. Did I mention I was still missing my evade saves? Time for the dreaded Vong! After my loss I was upset and still dead tired, I win map-side roll and setup on my preferred side. I still get gambit with the Speeder as he moves his Vong (and Dash) where they need to go. The two doors open and so begins battle. Speeder took a lot of damage thanks to Jedi Hunter, but I moved Crix in to disrupt most of their damage. Dash just couldn't seem to hit a darn thing. I still failed many of my evades, but managed to save a few Thud Bugs when I needed to (except on Leia). Speeder goes down after being nearly surrounded by Vong and Leia bites the dust thanks to JH. After that it was Crix and then Han. At the end I had my commanders, R7, and maybe an Ugg or two still alive. If you've never played Jonathan, he's a great guy to play. He definitely brought my spirits up a little after my last match. This was another bad match-up for my squad. With FlObi I knew I had to take down those Force Points as fast as I could and hope that he'd fail a SSM save. He won map roll and I setup on the outside of the Ruined Base. Now Josh is a relatively new player to Minis and did make a few critical mistakes. Like not moving adjacent to my pieces so I wouldn't have evade, and one with FlObi where he Surprise Moved away from the Snowspeeder. I was shocked and his brother (who was the judge) did his best to keep his mouth shut. He kills Leia after moving FlObi out, and I attempt to take away the last bit of health he had on him with Han. After a few more rounds I actually get FlObi gone and then start to work on Rex and Cody. They fall after some big hits and he decides to call the match since there wasn't a lot left for him to attack with. After the match his brother and I give him some tips on what he should look for next time. I think with some more rules help, he'll be a fine player in the Atlanta region. Ok, so I placed 15th overall with a record of 2-3. And...I'll be honest, that wasn't my goal and I was disappointed with how I played. I had figured I'd go 3-2 and be closer to the top 10, but again...lack of sleep and failed evades and poor setup won't win you a match. Now that I can look back on it, I feel I've learned a few things. -Setup is really really important, I should know my maps better. -I really should've done at least 1 play test with this squad. Its been too long since I've done a Snowspeeder squad. -Sleep is actually a good thing, and helps you to think clear. In light of that, I actually had a really good time. Not to mention the prize support was really awesome. I got Logray and Barriss JK from my grab bag, and Saesee from my pack. I also bought/traded for Dark Woman, Xizor (newest one), Captain Rex (CW one), and Lord Hoth. David also gave me a pack of Champions that he got from Graham and it had Depa in it. I definitely made out like a bandit when it came to minis.